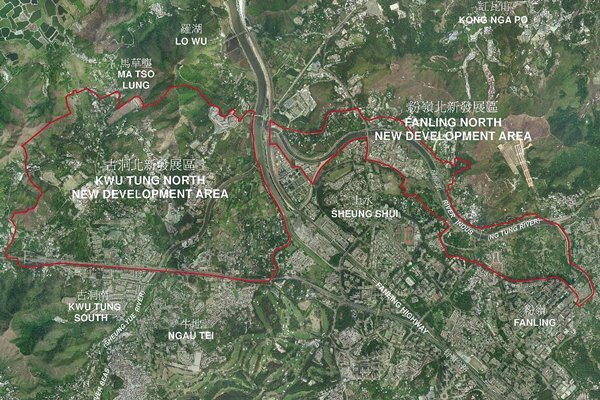 We published today in the Gazette the first phase infrastructure works of Kwu Tung North (KTN) and Fanling North (FLN) New Development Areas (NDAs) authorised by the Chief Executive in Council according to statute. We aim to seek funding from the Legislative Council for the first phase works in the first half of 2019 and commence land resumption and clearance for the first phase area in the second half. This is a significant step forward as the project is poised to enter the construction phase. The development of the KTN and FLN NDAs (formerly known as the Northeast New Territories) involves large-scale resumption of private land (including brownfields) in the New Territories. Not only are the two NDAs a core part of our multi-pronged strategies, they are of critical importance to our housing supply in the medium and long term. The KTN and FLN development has been beset with hurdles, and confrontations, since planning and consultation for the two NDAs restarted in 2008 (Table 1). Our experience shows that, while the NDA model provides a means to utilise existing land resources to make available sizable land for integrated re-planning, it is neither painless nor free of controversy. As Government-initiated NDA meets the definition of “public purpose”, the Land Resumption Ordinance will be invoked to resume most of the land in the two NDAs for development. Still, the development concerned will directly impact on existing land owners and users, including squatter households, farmers, rural workshops and brownfield operators. Of the total area of 612.5 hectares (ha) for KTN and FLN, almost 50% is preserved for the Long Valley Nature Park (LVNP), green belt and agricultural uses. The actual development area is about 320 ha (Figure 1). Upon completion, the NDAs will provide 72,000 housing units (nearly 70% as public housing) for about 190,000 people and create more than 40,000 job opportunities. Population intake is expected to start in 2023 and infrastructure works to complete in 2031. Full implementation of the NDAs will thus take more than 10 years to complete, and in the process impacting a total of 4,200 people in 1,500 households, 440 business operators and 28 ha of active farmland. Given the acute land shortage faced by our society, affected villagers and business operators would hopefully appreciate the wider public interest at stake in considering their own private interests. In pushing forward the NDA development, working out a solution to sensibly and reasonably compensate and rehouse affected villagers and business operators, and doing so in a manner which helps to minimise potential conflicts and facilitate the progress of clearance, have always been key challenges for the Government. Tackling such challenges calls for patient communications with stakeholders, as well as timely adjustments to implementation details, including revision to compensation and rehousing policies, where they are justified. The first phase development will require resumption of 68 ha of private land, as well as clearance of 100 ha of government land, 18 ancestral graves and two urns. It includes two sites of approved land exchange applications covering a total area of about two ha, as compared with the 68 ha of land to be resumed by the Government in the same phase. First phase works covers site formation and engineering infrastructures, including roads and sewerage, construction of the Fanling Bypass, as well as establishment of the LVNP as an ecological mitigation measure. Taking into account the payment of zonal A ex-gratia compensation for private land to be resumed within the NDAs, the estimated land resumption and clearance cost will be over $13.3 billion, whilst the main works will cost about $18.2 billion, representing an average cost per sq m of land of about $19,000. These figures have yet to take into account expenditures regarding the provision of rehousing units for affected villagers (including means-tested public housing units and non-means tested rehousing units), assistance to farmers on agricultural rehabilitation, as well as the reprovisioning of the residential care homes for the elderly (RCHE) in Dills Corner Garden. The compensation and rehousing arrangements approved by LegCo in July this year have gained broad-based support within the community. This shows that our society continues to be able to resolve problems and conflicts through patient and cordial dialogues and mutual understanding. In the coming months, apart from endeavouring to secure LegCo’s funding approval, we will continue to make the best possible preparations for land resumption and clearance for the first phase development. These include speeding up the screening exercise for the more than 400 households affected; offering assistance to the business operators who wish to relocate their business undertakings; finalising the timetable of phased clearance of the RCHE at Dills Corner Garden and ensuring the commencement of operation of the new RCHE complex in 2023 as scheduled; discussing with farmers options for agricultural rehabilitation; as well as rendering assistance as far as possible to villagers in handling their pets. We will also assess the number of affected villagers outside the first phase development who would wish to opt for early removal, and consider the necessary arrangements to be put in place. Development of KTN and FLN NDAs has just reached a critical milestone. 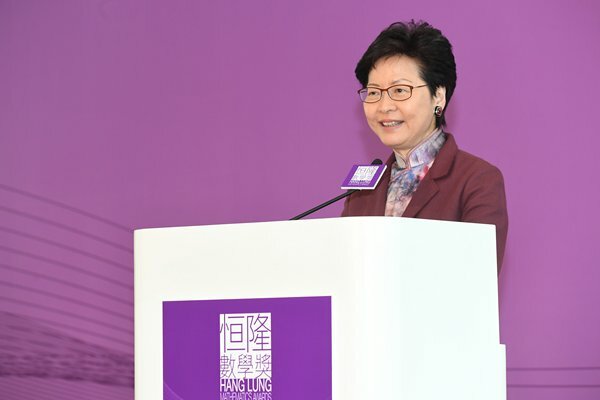 Having spent more than 10 years in planning, consultation and adjustment, we have now struck a reasonable balance between upholding Hong Kong’s wider interests and addressing the concerns of different stakeholders. Collaborative efforts from all concerned will continue to be required as we take forward the implementation of this and other NDAs. Let us work together and rise to the challenge! This op-ed piece from Secretary for Development Michael Wong was published in local newspapers on December 14. Resumed “North East New Territories” study with 3-stage public engagement. About 5,000 people attending a forum of September 2012 insisted “no relocation or clearance”. Executive Council (ExCo) agreed to go ahead with Kwu Tung North (KTN) and Fanling North (FLN) development first and special ex-gratia compensation and rehousing (C&R) arrangement for the NDAs. Town Planning Board held 45 full-day meetings to deal with about 53,000 comments on the draft Outline Zoning Plans (OZPs) for KTN and FLN. Police assistance was requested after clashes between attendees and staff. Some people were prosecuted for trying to force their way into the Legislative Council (LegCo) building when a confrontation broke out while the Finance Committee (FC) considered the funding application for the first phase detailed design. ExCo considered arrangements for elderly homes at Dills Corner Garden. ExCo approved draft OZPs for KTN and FLN. Over ten thousand objections were received each time when the original and revised schemes for first phase road and sewerage works were gazetted. Government met with objectors on various occasions to resolve disagreement. ExCo considered special rehousing arrangement for the NDAs. ExCo further considered special rehousing arrangement for the NDAs. ExCo considered new ex-gratia compensation arrangement for business undertakings. Dissatisfied with the C&R arrangements, the North District Council (NDC) requested Government to shelve the development plan. Enhanced C&R arrangement, approved by ExCo, obtained NDC’s support and FC’s funding approval. ExCo subsequently authorised road and sewerage works and land resumption limits. Through efforts to sustain the development of information technology (IT) in education, the Government aims to prepare students for challenges of the 21st century. Over the past two decades, we have been tapping into the power of IT to enhance the effectiveness of learning and teaching, and there has been remarkable enhancement in schools’ IT environment and capacity. Building on existing strengths and the experiences gained, the Education Bureau continues to unleash students’ potential and develop their learning to learn capabilities through leveraging on the use of IT. We have adopted a holistic approach that encompasses different strategic actions, which include enhancing schools’ IT infrastructure, promoting capacity building in schools, and renewing curriculum. By now and for the first time in Hong Kong, all 1,000 public sector schools have basically established a WiFi infrastructure on their campus. With WiFi service covering all classrooms, students can learn on their own and collaborate with one another by using mobile computing devices. This development provides a favourable environment for revolutionary changes both within and outside the classroom. What was once unlikely has or will become possible and practicable. To facilitate teachers in adjusting to the wave of change, we have been organising a variety of training programmes that seek to further enhance the professional leadership and capacity of school leaders and teachers. Schools have been positive towards implementing e-learning. Apart from devising their own e-learning plans according to their circumstances and needs, schools also adopt various e-learning strategies to enhance effectiveness of learning and teaching. I am excited to learn of these good practices in some schools. For example, various learning management systems facilitate peer collaboration, and enable students to exchange information and ideas or work on a project together anytime and anywhere. Also, the collection of learning data and the provision of timely feedback are at our fingertips, which encourages self-directed learning of students. The technologies of virtual reality and augmented reality are now used by schools to conduct virtual field trips and experiments, and to help students acquire new knowledge in various subjects and areas, such as Chinese history, geography, STEM education and language learning. While schools have different paces in implementing e-learning, the school community has generally demonstrated a paradigm shift in transforming learning and teaching through the innovative use of IT. In fact, competency in using IT is an important 21st century skill. We have also placed due emphasis on developing students’ information literacy, with a view to enhancing their awareness of e-safety and nurturing them as effective, responsible and ethical IT users. Since the update of the framework on “Information Literacy for Hong Kong Students” in 2016, various online resources and training programmes have been made available to support teachers in developing students’ information literacy and teaching students the right attitude towards using IT. I know that teachers have skilfully incorporated the element of information literacy into cross-curriculum learning activities that put students into authentic contexts. For example, the ability to locate reliable information among multiple sources and to identify facts and judgements when reading a news article is developed in library and language lessons. In addition, many schools have already agreed on a set of principles with students and their parents to ensure that students will use IT and IT tools to enhance learning in a responsible and proper way. With teachers’ adequate support, students set out to explore the digital world and this exploration has become part of their learning experience and daily life. To better equip the younger generation for a challenging future, we need to enrich the education sector with useful insights, expertise and innovation from different countries and regions. Let me take this opportunity to thank the Hong Kong Education City for making this exposition a valuable platform for educators to conceive and exchange innovative ideas on learning and teaching. I believe that what educators aspire to learn and do today will inspire the education community on tomorrow’s learning. 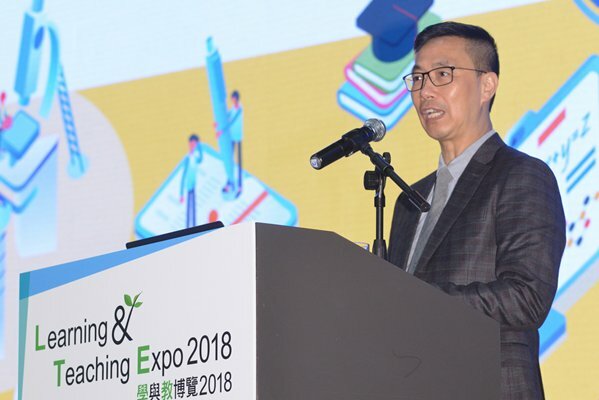 Secretary for Education Kevin Yeung gave these remarks at the Learning & Teaching Expo 2018 opening ceremony on December 12. Hong Kong has long been the pre-eminent bridge connecting Asia, including the Mainland of China, with the rest of the world. This connectivity is underpinned by an extraordinarily strong tradition of Hong Kong being the bastion of free trade. Indeed, Hong Kong has been ranked the world’s freest economy by the US-based Heritage Foundation and by the Canada-based Fraser Institute since 1995, without a break. This exceptional connectivity however is multifaceted. From finance, trade and logistics to, of course, tourism, Hong Kong is almost the synonym of connection, where ideas meet opportunities, investments meet ventures, demand meets supply, and where the East meets the West. This people-to-people connectivity has made Hong Kong the most visited city in the world according to Euromonitor International. First announced by President Xi Jinping in 2013, the Belt & Road Initiative spreads across Asia, Europe and Africa to promote infrastructural connectivity and financial integration, boost trade and investment, deepen policy co-ordination, and create stronger people-to-people bonds among participating countries. The initiative is about collaboration and sharing benefits. Hong Kong as the world’s freest economy, most visited city and China’s most international city, is an ideal partner in leveraging the potentials offered by the Belt & Road Initiative for tourism development. Let me take a moment to explain how this partnership works. Firstly, Hong Kong is the ideal place for arranging financing for any large-scale development projects with our deep liquidity and premier financial infrastructure. Hong Kong is the world’s largest offshore renminbi business hub and we have 44 heavy construction and engineering companies listed on our Stock Exchange. Hong Kong is also consistently ranked among the world’s top initial public offerings markets. It is highly likely that we will top the world again this year given the huge amount of funds raised so far this year. At the end of September, our stock market capitalisation stood at about HK$32 trillion, that is over US$4 trillion, which is 12 times our GDP. We have put in place measures to promote sustainable developments in the region. A Green Bond Grant Scheme was launched to subsidise the costs incurred by green bond issuers in obtaining green finance certification. A Government Green Bond Programme, with a borrowing limit up to HK$100 billion, will be rolled out soon. In addition, we have introduced a pilot Bond Grant Scheme plus tax incentives to attract more issuers to come to Hong Kong to issue bonds. Only in the first half of this year, we have attracted at least 15 green bonds issues, raising an aggregate amount of US$8 billion. Hong Kong is also a member of the Asian Infrastructure Investment Bank. We have also set up an Infrastructure Financing Facilitation Office under the Hong Kong Monetary Authority to provide a platform for pulling together investors, banks, financial institutions and infrastructure owners and operators to offer comprehensive services for various infrastructure projects. All the above have made Hong Kong an ideal partner for arranging financing for tourism projects, which are essential to propel tourism development. Secondly, Hong Kong as a regional education hub, has world-class universities, professional bodies and international schools to provide a wide range of educational and training opportunities for students in Belt & Road countries in meeting global standards of excellence. For tourism in particular, we have one of the world’s best hotel and tourism schools. The Hong Kong Polytechnic University’s School of Hotel & Tourism Management has been ranked No. 1 in 2017 in the Hospitality & Tourism Management category in ShanghaiRanking’s Global Ranking of Academic Subjects, as well as in the Hospitality, Leisure, Sport & Tourism subject area by the Center for World University Rankings. It is also ranked among the top three hospitality and leisure management institutions globally in the QS World University Rankings by subject in 2017 and 2018. On top of that, we offer world-class training opportunities for hoteliers. Our city’s many international hotel brands, including home-grown Mandarin Oriental and the Peninsula, make us the best place to acquire first-hand experience of world-class hotel operations. We are taking forward a number of measures to provide a quality education platform here for both local and non-local students, which include expanding quotas for admission of non-local students, setting up a Government Scholarship Fund for outstanding local and international students, and allowing students from outside Hong Kong to stay here without limitation for up to 12 months after graduation. Thirdly, Hong Kong maintains an open immigration regime and we welcome talents from around the world to work, live, study, invest and travel in our city. Currently, nationals of about 170 countries and territories can visit Hong Kong for business or leisure visa-free. To further facilitate tourist flow between Hong Kong and Belt & Road countries, we will consider relaxing visa requirements for nationals of Belt & Road countries. We hope other countries will consider the same for the common good of our tourism sector. Fourthly, Hong Kong is a place full of contrasts, diversity and dynamism. We offer a broad range of tourism products to cater for the diverse interests of visitors. This involves constant upgrading and improvement of services, creating and reinvesting in new attractions, and rediscovering hidden treasures in our tourism resources. For example, Tai Kwun, the rejuvenation of three historical monument buildings in Central, is now a new exciting cultural landmark and a must-see for tourists. Our two flagship theme parks are also wasting no time to expand their capacity and enhance attractiveness. Hong Kong Disneyland will have new attractions almost every year to 2023 under its multi-year expansion plan. For Ocean Park, it just opened a new hotel last month, and will be commissioning a new waterpark and another hotel in the next few years. We will also see a much enhanced list of tourist attractions, including the heritage and cultural offerings at the West Kowloon Cultural District as well as the integrated development of the SkyCity development adjacent to the Hong Kong International Airport, comprising retail complexes, dining areas, hotels and entertainment facilities. We also roll out district tourism programmes to assist and entice visitors to explore Hong Kong’s local life and districts’ characteristics. Visitors will experience first-hand and in close encounters the local character of Hong Kong as a city where the East meets the West, where tradition crosses over with modernity. We are not missing our rich green tourism resources which are within arm’s reach of our city centre. Apart from our normal countryside tourism offering, this year, we have launched a scalable School Excursion Programme package for secondary schools outside Hong Kong, combining school exchange with an immersive conservation and cultural focus. We pulled together the green tourism attractions in the “four corners” of Hong Kong, that is, Ocean Park in the south, the Mai Po Ramsar Site and the Hong Kong Wetland Park in the north, the Hong Kong UNESCO Global Geopark in the east and Ngong Ping 360 in the west, together with Tai Kwun, PMQ and the Dr Sun Yat-sen Historical Trail, etc, which offers a probably unrivalled experience of learning, adventure, fun, thrill and amazement, yet in a safe and easy to get around setting. We hope this programme can help contribute to better mutual understanding amongst the kids of different cultures. Creating new tourism products aside, city management, municipal services and quality assurance as well as safety are all important ingredients to fulfil a good tourist experience. Any city that is safe and easy to travel will be greatly welcomed by visitors. On this, I am proud to report that Hong Kong is one of the safest cities in the world, and a city that is easy for any tourists to get around with its efficient public transport and tourist-friendly facilities. On top of our diverse tourism offerings, Hong Kong’s advantages as a global aviation hub and well-connection with the Mainland offers enormous opportunities for regional co-operation, for instance, multi-destination travel and the development of “fly plus cruise” and “rail plus cruise” travel products. The Hong Kong International Airport provides excellent connectivity with over 120 airlines serving over 220 destinations worldwide. There are over 1,100 flights daily to and from the airport, reaching half of the world’s population within five hours’ flight time. The commissioning of the Hong Kong Section of the Guangzhou-Shenzhen-Hong Kong Express Rail Link and the Hong Kong-Zhuhai-Macao Bridge has further enhanced our connections with the Mainland. Our Kai Tak Cruise Terminal can accommodate the largest cruise ships in the world. Together, we can create a win-win situation for all by strengthening the regional collaboration through for instance, development of mutually supporting cruise itineraries. As for the Guangdong-Hong Kong-Macao Greater Bay Area development, it is an ambitious city cluster development encompassing Hong Kong, Macau and nine cities in the Guangdong Province of the Mainland. Working together, the synergies to be brought about by these cities are obvious and tremendous. The greater bay area city cluster possesses abundant tourism resources with distinctive appeals, such as Guangdong’s traditional Lingnan culture and Macau’s entertainment and leisure resources as well as Hong Kong’s vibrancy and diversity as an international metropolis. Our different yet complementary advantages combined enable the greater bay area to rival other famous bay areas in the world. Together, the greater bay area presents to the world a model of cross-city co-operation and that tourism development is not a zero-sum game. We work together in every aspect to create an even bigger pie for all. 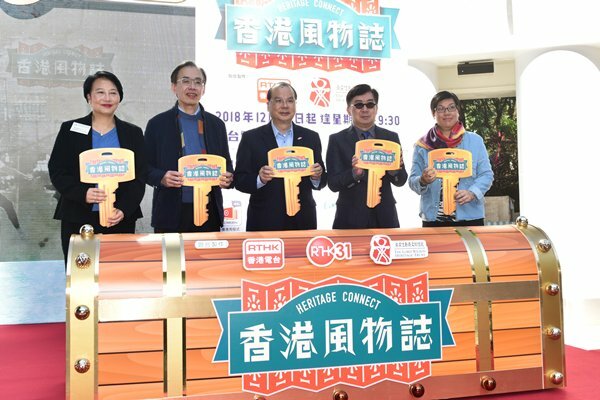 In this connection, the city clusters would further collaborate to develop more “one trip multi-destination” tourism products and conduct joint promotions overseas. In fact, our survey suggests that 45% of our short-haul visitors are taking multiple destination itineraries while the figure for long-haul visitors is remarkably over 80%. To facilitate international travellers, foreign nationals in Hong Kong can visit Guangdong Province for a maximum of 144 hours visa-free. This allows international travellers ample time to experience the diverse tourism offerings of Hong Kong and Guangdong Province, while ensuring the border crossing is hassle free. What’s more is the exponential improvement in land connection with the Mainland and Macau that makes such “one trip, multi-destination” travel even easier. In addition to the commissioning of the Guangzhou-Shenzhen-Hong Kong Express Rail Link in September and the opening of the Hong Kong-Zhuhai-Macao Bridge in October, another cross-boundary infrastructure in Liantang/Heung Yuen Wai, connecting Hong Kong to the expressway in the eastern part of Guangdong, is expected to be completed soon in 2019. Indeed, the commissioning of three key infrastructures in a city in about a year is probably very much unprecedented in the world. 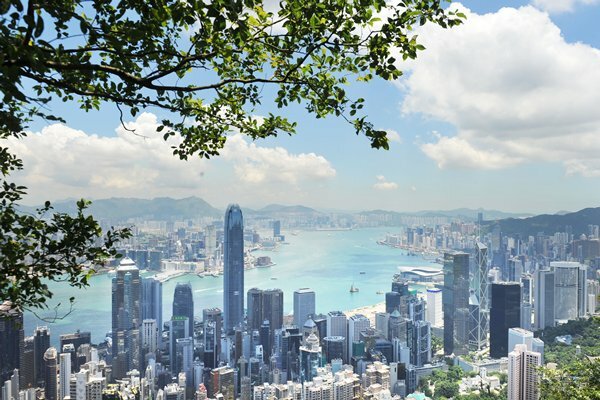 Hong Kong’s enhanced connectivity with the greater bay area and beyond would make Hong Kong an ideal launch pad for international travellers to start their vacations. On top of that, the greater bay area adds more opportunities for Belt & Road countries. The greater bay area has pulled together a spectacular 69 million population which is the most affluent part of China. The collective GDP is over US$1.5 trillion, comparable to that of South Korea. The greater bay area is, I would say, a large source market for tourism for Belt & Road countries to tap. Ladies and gentlemen, I don’t need to expound on the importance of tourism to economic development and the enrichment of people’s life. The question is how we can do better and achieve more. The Belt & Road Initiative and the greater bay area development, which are about collaboration and sharing benefits, have presented us with new potential. And Hong Kong as the world’s most visited city, freest economy, top financial centre, safest city, and one which has one of the world’s best educational facilities and the world’s top hotel brands, is your ready partner to leverage on the opportunities offered by the two initiatives. We are committed to strengthening co-operation with different economies to promote tourism development, be it regionally or internationally. 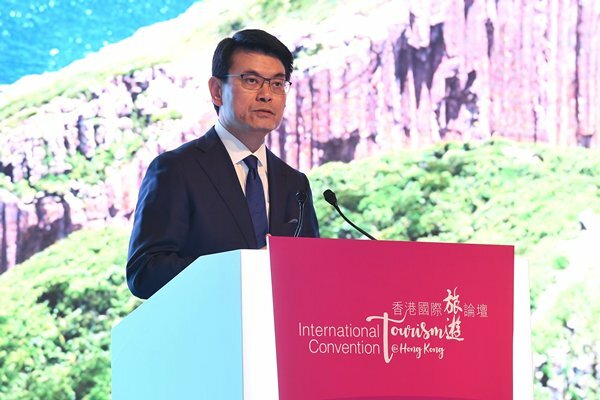 Financial Secretary Paul Chan gave these remarks at the Hong Kong International Tourism Convention on December 12. In a time of increasing unilateralism and protectionism, tourism is a welcome tonic – a buoyant multilateral embrace of shared experience, cultural co-operation and people-to-people bonds. Indeed, connectivity, inclusiveness, the promise of mutual benefits and many other ambitions are the reasons why President Xi Jinping launched the Belt & Road Initiative some five years ago. We know that developing people-to-people bonds is one of the five connectivities pertaining to the Belt & Road Initiative, and we believe that tourism exchange is a powerful means of promoting such bonds. Tourism exchange can foster people’s understanding and appreciation of each other’s culture and living. This provides the foundation for closer and stronger relationships and co-operation in the longer term. Multilateral co-operation is no less central to the Belt & Road Initiative and to tourism development. Easing visa regulations, expanding flight connections, enhancing cultural co-operation – these and other considered measures can only help boost tourism and the rewards they offer us all. In developing regional tourism, for example, multi-destination visits can be effective. Consider, for example, the Asia Cruise Cooperation, a strategic alliance among Hong Kong, Hainan, Taiwan, Xiamen, the Philippines and Korea, in which alliance members jointly promote cruise tourism for mutual benefits. The Belt & Road Initiative is about capacity building and sharing benefits. Hong Kong is an international hub for professional services, from financial and legal, to architectural, communications, transportation management and many more. We also run one of the largest hospitality and tourism schools in Asia. We have the expertise, the experience and the institutions to provide services to other economies along the Belt & Road on tourism infrastructure developments, as well as train professionals for the tourism industry. And we look forward to playing a central role in the Belt & Road Initiative’s international tourism development. Closer to home, the Guangdong-Hong Kong-Macao Greater Bay Area has the means to rival Tokyo, San Francisco and New York-the world’s three renowned bay areas-in tourism potential. The bay area’s size and significance underscore that promise. With a collective population of 70 million, the bay area boasts a combined GDP of some US$1.5 trillion, that is roughly the size of Australia or South Korea. The greater bay area’s tourism offerings are wide-ranging and undeniably inviting – from cosmopolitan, East-meets-West Hong Kong and the entertainment capital of the world, Macau, to the rich Chinese culture and heritage of the greater bay area’s nine Mainland cities. At the same time, the greater bay area is an important source market for other economies given its high level of affluence. You will hear more in-depth sharing of what this greater bay area means for international and regional tourism in one of the plenary sessions this morning. I believe that Hong Kong is uniquely positioned to drive tourism opportunities emanating from the Belt & Road Initiative and the greater bay area. And my Government is committed to realising Hong Kong’s tourism potential. Last October, we published a development blueprint for Hong Kong’s tourism industry. It emphasises four key strategies: diversifying our visitor source markets; offering tourism products with international and local characteristics; promoting smart tourism; and enhancing our service quality. Enhancing connectivity is the key for the strategies to work. In this connection, our Hong Kong International Airport links more than 70 million passengers a year to 220 destinations. And we are now expanding the airport into a three-runway system. On completion in 2024, we will have the capacity to handle up to 100 million passengers a year. On land, the Hong Kong section of the Guangzhou-Shenzhen-Hong Kong Express Rail Link opened at the end of September. It now offers direct connection from Hong Kong to 44 Mainland destinations. And from those destinations, the rest of China opens up through the nation’s 25,000-kilometre high-speed rail network. Then there’s the Hong Kong-Zhuhai-Macao Bridge, which opened in late October and speeds us to the greater bay area’s western region. The impact of the bridge in bringing tourists to Hong Kong is obvious. Therefore, we have been working to ensure that our tourist spots and local communities are prepared. We are also collaborating with the Zhuhai and Macau authorities to ensure that our guests can have the best experience in Hong Kong. I should also add that there will be a new – which is the seventh – land boundary control point between Hong Kong and Shenzhen at Liantang/Heung Yuen Wai. To be completed next year, this boundary control point will significantly shorten the time needed to travel from Hong Kong to the east of Shenzhen and beyond. All these infrastructure projects open up new opportunities barely reachable before and provide a solid foundation for Hong Kong to serve as an international gateway of the greater bay area. Hong Kong has received about 60 million visitors so far this year, including over 13 million international visitors, and was ranked as the most visited city in the world by Euromonitor International. Coupled with the fact that Hong Kong is the world’s freest economy and China’s most international city, Hong Kong is best positioned to leverage the vast tourism potential of the Belt & Road Initiative and the greater bay area development. We are prepared to grasp these opportunities ahead of us, and we welcome you to join us. 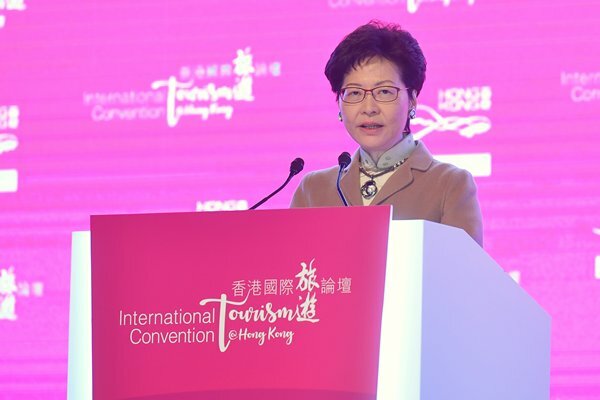 Chief Executive Carrie Lam gave these remarks at the Hong Kong International Tourism Convention on December 12. In the Asia-Pacific region, there is a significant infrastructure financing deficit. According to data from the Global Infrastructure Hub, established under the G20 umbrella, the estimated investment needs for infrastructure projects are expected to average US$2.1 trillion per year over the five-year period from 2020. Against this background, the Asia-Pacific Economic Cooperation Finance Ministers suggested in the Joint Ministerial Statement that the investment needs could be “addressed by diversifying the available sources of long-term finance and fostering private sector involvement, including the creation of enabling conditions for attracting investment, generating pipelines of ‘bankable’ infrastructure projects and developing financing structures capable of attracting long-term institutional investor capital”. And APEC member economies were encouraged to “adopt policy approaches that follow good practices, facilitate project transparency, ensure timely access to qualitative and quantitative project information, and promote opportunities to potential investors”. I very much agree with the importance of “bankability” and “timely access to qualitative and quantitative project information”. According to GIH, when assessing an infrastructure project, investors will look at whether they have efficient planning, an alignment of political will, a co-ordinated enabling environment, a reliable return, and sensible, shared risk allocation. If all the above criteria are met, investors may consider a project to be bankable. So, one of the key determinants of the bankability of infrastructure projects is “sensible, shared risk allocation”. Bankable projects must be in the first place sufficiently insured and reinsured such that risks are shared sensibly. Thus, increasing infrastructure projects in the region not only creates demand for financing but also demand for insurance and reinsurance to make them bankable. Insurers therefore play a very unique role in infrastructure development: On one hand, they are insurance providers enabling bankable infrastructure projects and, on the other hand, they are long-term institutional investors of such projects which generates stable returns. The second important element is “timely access to qualitative and quantitative project information”. Without accessible information, insurers and investors will not be able to assess the risks and returns of a project. In Hong Kong, the Hong Kong Monetary Authority set up the Infrastructure Financing Facilitation Office back in 2016 to provide a platform for banks, insurers, and construction companies to connect and collaborate on infrastructure projects under the Belt & Road Initiative. I am very glad the Insurance Authority has just launched the Belt & Road Insurance Facilitation Platform for a similar purpose but with a clear emphasis on insurance. I am sure the two platforms will complement each other to ensure that partners on the two platforms can have “timely access to qualitative and quantitative project information” so that they can collaborate to enable such projects through financing and risk management. The huge demand for infrastructure investment will logically stimulate innovation in infrastructure financing to expand lending capacity. Due to capital adequacy requirements, banks have limits in financing long-term infrastructure projects. Thanks to securitisation, banks’ lending capacity can be expanded through securitisation of infrastructure loans, which enable banks to move long-term assets off their balance sheets and relieve pressure resulting from tighter capital requirement regulations. After offloading, banks can then have capacity to finance new infrastructure projects. For example, the Japanese bank SMBC (Sumitomo Mitsui Banking Corporation) issued in 2016 its first project finance loan securitisation note to be sold to institutional investors. The loans were related to large-scale solar power plants. I envisage that such securitisation will become more active in Asia in the light of a significant infrastructure financing deficit. The Hong Kong Mortgage Corporation Limited, again under the HKMA, is pursuing the proposition of securitising infrastructure loans to provide banks with opportunity to offload their loans to those long-term investors. That will facilitate additional cash flow into infrastructure projects. In the insurance sector, securitisation of risks, such as natural disaster risks, has also been developing fast. On one hand, insurance-linked securitisation can be seen as an alternative to reinsurance, thereby enriching the risk management tools in the market. By securitising insured risks, reinsurers can transfer the risks to capital markets, so as to expand the capacity of the reinsurance market. In parallel, insurance-linked securities (ILS) provide institutional investors with an investment alternative that is not related to economic cycles, helping them to diversify the risk of their investment portfolio. That is why the Financial Leaders Forum, which I chair, has suggested earlier this year that we should take steps to encourage the development of the ILS market in Hong Kong. I am glad that the Insurance Authority is working closely with the Government on the legislative framework to facilitate the formation of Special Purpose Vehicles specifically for issuing ILS in Hong Kong. The target is to introduce the legislative amendments into the Legislative Council in the 2019-20 legislative session. I am sure Hong Kong is well positioned to benefit from increasing interest in ILS in the region, especially given that Mainland insurers would be interested in using different tools to manage a range of risks, be they agricultural, natural disaster or infrastructural risks. Now let’s move on to my Beijing trips. The first trip to celebrate the 40th anniversary of the country’s reform and opening up prompted me to reflect on how Hong Kong has been facilitating the internationalisation and expansion of the Mainland financial markets. The first Mainland enterprise was listed in Hong Kong back in 1993. Today, more than half of the companies listed on our Stock Exchange are Mainland enterprises. Over the years, we have seen the development of Red Chip Shares and A+H shares, and the rolling out of mutual market access schemes, including the Stock Connects and the northbound Bond Connect. All these developments have exemplified the important role of Hong Kong in facilitating the development of the Mainland capital markets. More recently, we are seeing Mainland companies with weighted voting right structure from the emerging and innovative sectors taking advantage of our reformed listing regime to list in Hong Kong. This is again a testimony of our position as China’s leading financing hub. This role will not change as long as Hong Kong can act quickly in response to the changing financial landscape. With the establishment of the Insurance Authority three years ago, we are more active in fostering co-operation between Hong Kong and the Mainland to spur further growth of the insurance industry. I envisage that the opening up of the Mainland insurance market will accelerate. As you are probably aware, in April, the Mainland authority announced that the foreign ownership cap for life insurance joint ventures would be lifted from 50% to 51% and the cap would be removed completely in three years thereafter. And last month (November 25), the China Banking & Insurance Regulatory Commission announced that it had approved the establishment of China’s first foreign insurance holding company. With the support of national policies, insurers in Hong Kong will enjoy competitive advantages in the course of the opening up of the Mainland insurance market. One recent example of such support is the CBIRC’s decision in July that when a Mainland insurer cedes business to a qualified Hong Kong professional reinsurer, the capital requirement of the Mainland insurer will be reduced. This preferential treatment will facilitate co-operation between the Mainland and Hong Kong in cross-boundary reinsurance business, and enable Hong Kong’s reinsurers to enjoy competitive advantages over other offshore reinsurers. Indeed, we see much opportunity for the Hong Kong insurance industry to help and participate in the development of the country. Therefore during my second visit in Beijing, together with Clement (Cheung), the CEO of the Insurance Authority, we raised with the CBIRC specifically the possibility of allowing Hong Kong insurance companies to set up after-sales service centres in the Guangdong-Hong Kong-Macao Greater Bay Area to better serve the residents in the area. Although opportunities abound and Hong Kong is well positioned to capture them, we should not be complacent. We need to strengthen our fundamentals continuously. Currently, professional reinsurers and captives can enjoy 50% profits tax concession, meaning that the tax rate for them is only 8.25% in Hong Kong. We are also working on tax relief measures to stimulate the growth of marine insurance and the underwriting of specialty risks in Hong Kong. But tax is just one of the many factors in determining where insurance contracts will be placed. Ready availability of professionals underwriting specialty risks, structuring insurance-linked securitisation and advising on captive arrangements will be instrumental in sharpening Hong Kong’s competitive edge as an insurance hub. Nurturing, attracting and retaining talent is an area we should focus on to ensure Hong Kong’s continued success. On this topic, the Government announced in September this year a Talent List, which helps us attract quality professionals in specific sectors to accelerate our development into a high value-added and diversified economy. The Talent List currently focuses on 11 in-demand professions, including actuaries. I welcome more ideas from the insurance industry on how Hong Kong can attract and retain top-notch talent for the industry. 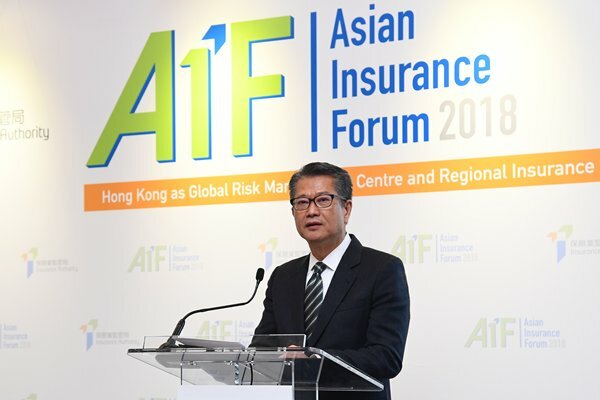 Financial Secretary Paul Chan gave these remarks at the Asian Insurance Forum 2018 Keynote Luncheon on December 11. In less than a month’s time, we will be welcoming the new year. And, looking back, 2018 has already secured its place in history as a particularly eventful year. In the financial sector, there were ups and downs in the past 11 months. The Hang Seng Index rose to more than 32,000 points in January, before a recent 20% correction. Despite the market volatility, our financial system has remained robust and resilient. In September, Super Typhoon Mangkhut hit Hong Kong, causing massive disruption. It was the strongest storm in Hong Kong’s recorded history. Fortunately, there was not a single fatality from the storm and only minimal damage to our built infrastructure. Government clean-up teams and many groups of volunteers helped to get the city back on its feet in next to no time. I mention this because it underscores two key attributes – the quality of our physical infrastructure and the resilience of our community. Quality infrastructure was in the spotlight in the latter part of 2018, as we witnessed the commissioning of two mega infrastructure projects – the Hong Kong-Zhuhai-Macao Bridge and the Guangzhou-Shenzhen-Hong Kong Express Rail Link. These world-class cross-boundary corridors have furthered enhanced Hong Kong’s connectivity with the Mainland, facilitating flows of trade, talent and ideas between Hong Kong and its hinterland, particularly the Guangdong-Hong Kong-Macao Greater Bay Area. The year 2018 has also proven to be a turbulent time on the macroeconomic scale, including growing protectionist sentiments in some countries, geopolitical conflict and severe natural disasters, and more lately trade war between China and the United States and major protests in France. Although Hong Kong has proven its resilience, we cannot afford to be complacent. We cannot and we will not compromise on quality, whether it be the quality of our infrastructure, quality of talent or quality of our systems, including our financial and legal systems. Despite lingering global economic uncertainties, including trade relations between China and the United States, I am optimistic about Hong Kong’s outlook. Third quarter figures show that our unemployment rate remains at a record low of 2.8%, export of goods rose 5% and export of services expanded by 3.1% compared to the same period last year. Looking ahead, Hong Kong is primed to play a key role in our country’s rapid development. As a leading international financial centre, we can anticipate strong demand for our financial services in the Guangdong-Hong Kong-Macao Greater Bay Area, a region covering 11 cities of nearly 70 million people with a collective GDP of about US$1.5 trillion. The fact that Hong Kong serves as a financial launchpad for the Greater Bay Area is evidenced by Hong Kong Fintech Week last month, which, for the first time, featured events in both Hong Kong and Shenzhen. Some 8,000 professionals from more than 50 economies took part in Fintech Week. I anticipate that this cross-boundary model will be adopted by more events in the Greater Bay Area in future. An integrated Greater Bay Area, fused by quality infrastructure, quality services and quality talent, will in turn stimulate demand for high-quality insurance and risk management services. This forum is a great opportunity for industry players to brainstorm new ways for the insurance industry to contribute to and benefit from the Greater Bay Area. Looking further afield, we also sit at a critical junction for the Belt & Road Initiative, a converging point for international trade and world-class professional and financial services. Boosting infrastructure development is a priority objective under the Belt & Road Initiative, which covers more than 60 countries across Asia, Africa and Europe. According to an estimate by the Asian Development Bank, as much as US$1.7 trillion per year is needed for infrastructure investment in Asia until 2030. Such infrastructure developments will generate demand for project financing and insurance solutions to manage financial, legal, political and regulatory risks. In this connection, I applaud the Insurance Authority for launching its new Belt & Road Insurance Facilitation Platform. I am confident that the platform will provide stakeholders with timely and relevant Belt & Road information to help them capture new business opportunities. The HKSAR Government acts as a “facilitator” and “promoter” to create opportunities for the insurance industry. Last December, we concluded an agreement with the National Development & Reform Commission on Hong Kong’s participation in the Belt & Road Initiative. This secures the support of the Central Authorities to encourage Mainland enterprises to establish captive insurance companies in Hong Kong to underwrite risks for their overseas business. The Central Authorities also support Hong Kong to provide professional services such as insurance and re-insurance for large-scale infrastructure projects under the Belt & Road Initiative. Meanwhile, Hong Kong has already been offering a 50% profits tax concession for professional reinsurance and captive insurance businesses. In my Policy Address in October this year, I further proposed tax relief to help promote the underwriting of specialty risks in Hong Kong. In addition to tax incentives, we are eager to modernise our legislation to facilitate market development. Again in my 2018 Policy Address, I announced that we will make legislative amendments to allow for the formation of special purpose vehicles in Hong Kong specifically for issuing insurance-linked securities (ILS). According to an international reinsurance company, the global market size for ILS is around US$80 billion. In the first half of 2017, the amount of newly issued ILS exceeded US$8 billion. Hong Kong is well positioned to attract the issuance of ILS by Mainland companies. We also facilitate and promote growth of marine insurance business in Hong Kong, which is crucial to the development of the maritime and insurance sectors. Hong Kong is a natural marine insurance hub for the region. Indeed, the International Union of Marine Insurance set up its first Asian chapter in Hong Kong in 2016, the first time in the organisation’s 142-year history to establish a permanent presence outside of Europe. The opening of the Union’s Asian hub in Hong Kong exemplifies its confidence in our city’s position as a prominent industry player in Asia. I have also tasked the Insurance Authority to explore streamlining regulation to facilitate the operation of protection and indemnity clubs for shipowners in Hong Kong. I welcome more ideas from the industry on ways that we can make Hong Kong an attractive hub for high-value-added maritime services, including marine insurance. I understand the Financial Secretary, Mr Paul Chan, will talk in more detail about some of these topics during the Keynote Luncheon later today. For now, allow me to assure you that my Government is committed to reinforcing Hong Kong’s role as a global risk management centre and insurance hub. 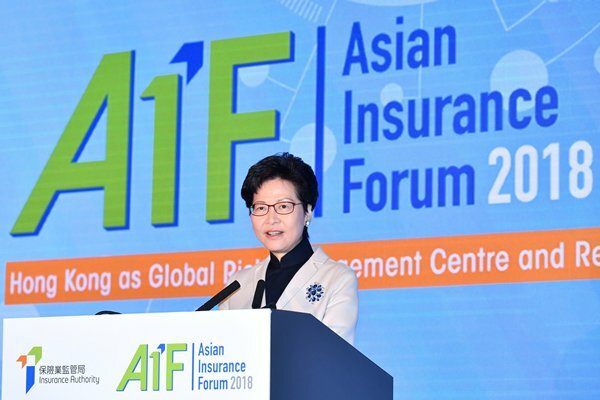 Chief Executive Carrie Lam gave these remarks at the Asian Insurance Forum 2018 on December 11. My Government is equally committed to education, to ensuring that it is comprehensive, that it is of the highest quality, that it is available to all, whatever their background, whatever their financial means. What we are still searching for answers for is the best approach to nurturing our young minds to meet the needs of a rapidly changing world and to rise to challenges brought by advances in technology. In my Election Manifesto when campaigning for the position of the Chief Executive in early 2017, I said talent is the most important element in Hong Kong’s continued development and education is the key to nurturing talent. I pledged that Government expenditure on education is the most significant investment for our future. Since taking office last July, I have committed some $8.3 billion in our annual recurrent expenditure on education, or an increase of over 10%. At the same time, I have invited some 70 education experts to help us review various aspects of our education policies. I know of course that money alone is not enough – and never will be. We need to be guided by evidence in improving our education and by applying technology in so many relevant ways to help students to learn and excel. 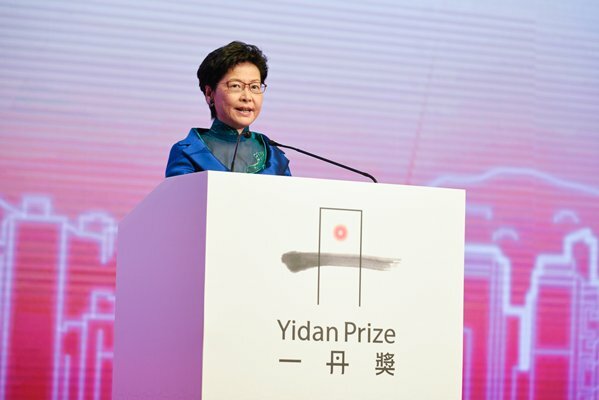 Chief Executive Carrie Lam gave these remarks at the Yidan Prize Award Presentation Ceremony 2018 on December 9.